Home » For the Home » The Easiest Laundry System = Time & Money Saved! The Easiest Laundry System = Time & Money Saved! When you live with multiple generations and pets under one roof, there is always a lot of laundry. 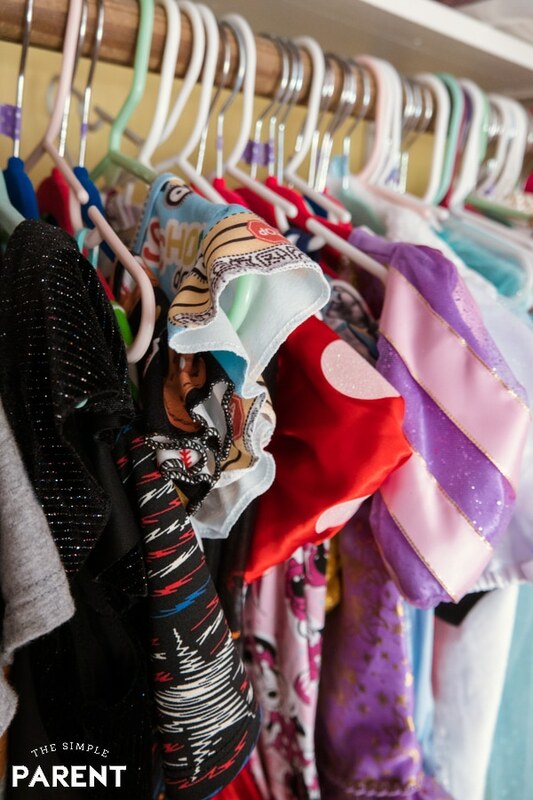 Add in that the two kids are busy with activities that require special clothing like leotards, tights, baseball pants, and jerseys, and you’ve got laundry to do ALL the time! This year we’re simplifying our laundry life with the EASIEST LAUNDRY SYSTEM EVER! It only takes three steps to save yourself time doing laundry. Less time in the laundry room means more time with the family or more time for yourself! I’m all for more me time! This post is sponsored by Tide. All opinions and experiences are my own. EASIEST LAUNDRY SYSTEM FOR FAMILIES EVER! Before I share the super simple laundry system we’ve developed in our house, I have a piece of advice! This year I’m seeing a lot of people getting into clearing out things they don’t need or use anymore. It’s a perfect approach when it comes to laundry too! One of the first things to do to set your family’s laundry system up for success is to clear out those clothes! If your house is like ours, it probably feels like there are clothes everywhere! I’m always finding socks and sometimes even shorts in the weirdest places. Plus my kids have closets and drawers full of clothes they barely wear and I find myself trying to stuff clean laundry into them. So once a season we go through the drawers and the closets to get rid of the clothes that are too small or out of season. We just went through and got rid of all of the holiday shirts from last year. My kids won’t fit in them when the holidays roll around again so we pulled them out and donated them. It’s the easiest way to clear out extra room for the clothes that are getting worn. It’s an optional preparation step but is a huge help as you change up your home laundry system to save you time and money! 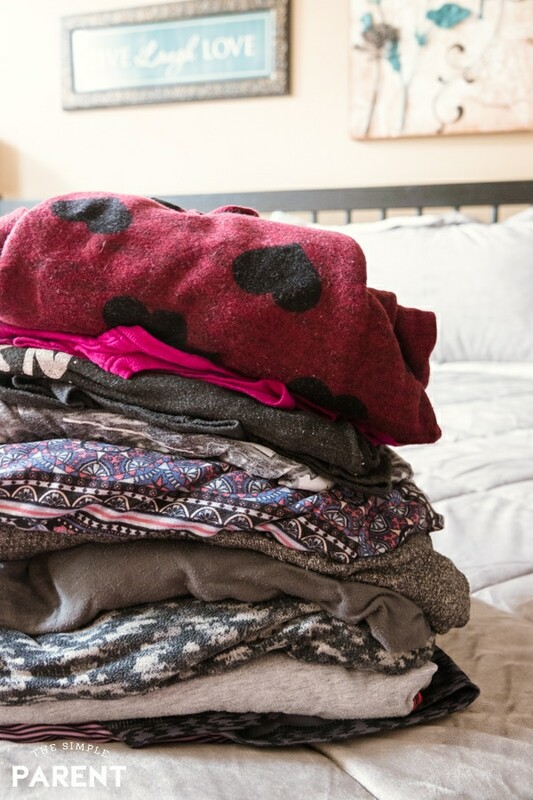 If you sort your laundry by colors and whites or lights and darks — STOP! Sort the laundry by person. Your colors and whites will be fine. Now, I will say that if we have a brand new red shirt or a brand new pair of dark jeans, we do our best to wash it with like colors, but that’s a special situation. We don’t buy brand new clothes every day. So most of the time, you don’t need to worry about this. If you’re worried about colors running, you can add vinegar to your laundry load to help set the colors. So stop sorting the laundry now! Stick to this simple laundry sorting system! Sorting by person isn’t really sorting if each person has their own laundry basket. We each have a basket in our closet (yes, I even have a separate basket from Justin) and I do the laundry one load at a time when the basket is full enough. No separating the clothes and no figuring out whose socks are whose! Only my clothes go in with each other so only my clothes come out with each other! It saves time sorting before and after the clothes have been washed. It’s my own simple laundry basket system. We also have one basket that sits in the laundry room for towels and sheets. So I can do a load of those as needed. 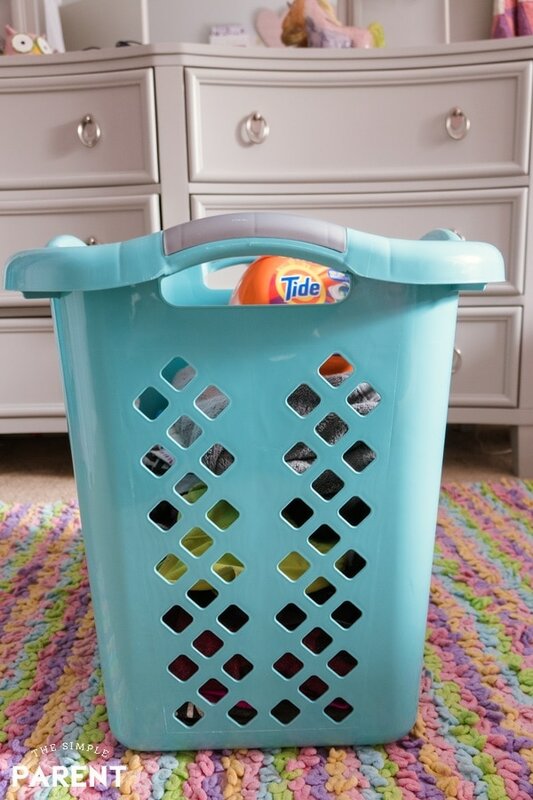 We streamline our laundry process and keep the clutter down in the laundry room by sticking to one laundry detergent. Now that the kids are older, I wash all of our clothes using Tide because I know I can count on it to get our clothes clean. We don’t waste detergent and it can handle even the toughest stains my kids throw at their clothes! By using Tide, our clothes come out clean on the first wash. By combining that with the QUICK WASH cycle on my washing machine that uses cold water, I also find that we save money by sticking to one detergent. 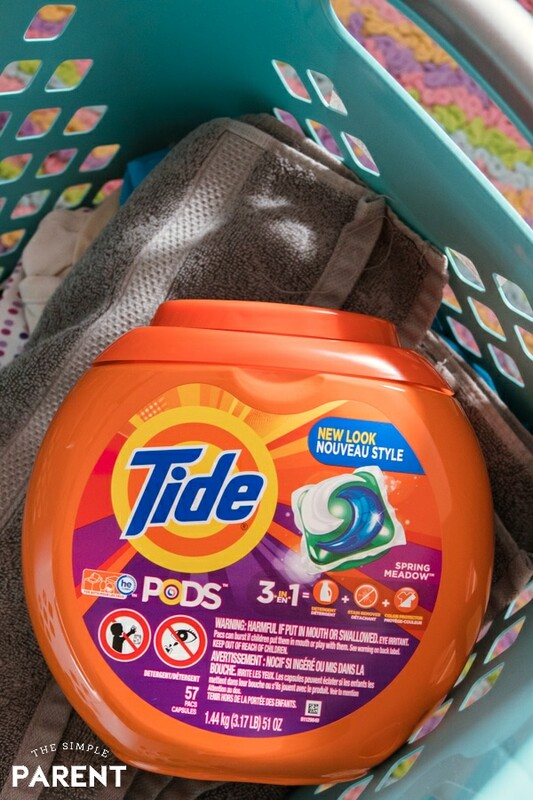 In the past we’ve used Tide Liquid Laundry Detergent, but we’ve now switched to using Tide PODS for convenience factor and to make sure we’re not wasting detergent! The new Tide PODS 2.0 have ever better stain and odor removal power which is exactly what my family needs! The 4-in-1 technology includes detergent, stain remover, color protector, and built-in pre-treaters all in one! 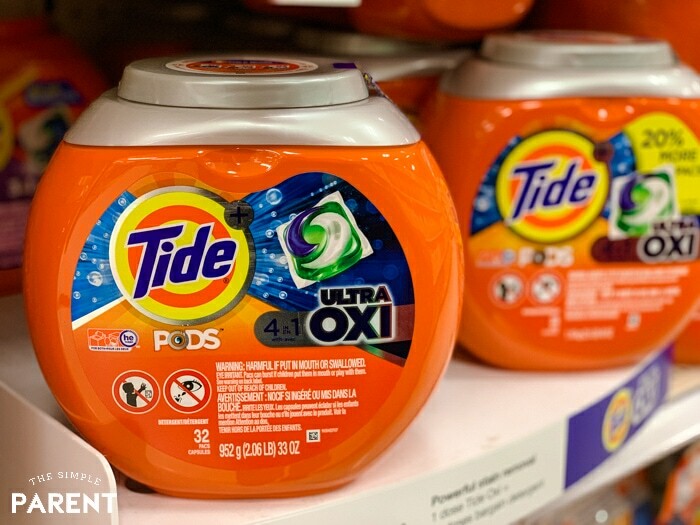 See how you can save time with Tide PODS? So stock up on your favorite variety of Tide Detergent or Tide PODS and tackle your family’s laundry with ease! Doing laundry daily might seem like a huge chore when you first think about it, but I’ve found I’m far more productive when I only have one load to do in a day. If I save all the laundry for a Saturday, I end up miserable and it takes me longer to move clothes through. So I do a load a day. Sunday – We only do laundry as needed! This usually ends up being additional towels, linens, and baseball gear if we need to do a load. 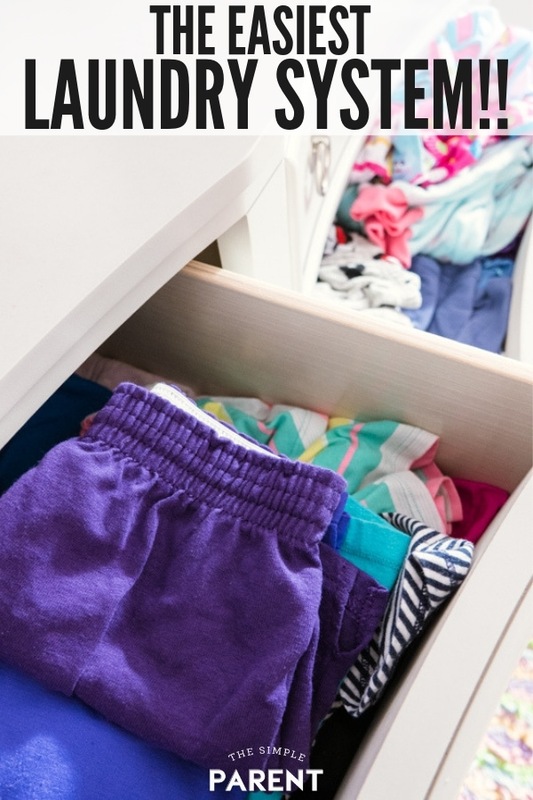 This helps us avoid the laundry pile up that can happen with a big and busy family! So why should you overhaul your family’s laundry system? To save time and money! You’ll save time if you tackle a little bit of laundry each day because you won’t be left feeling overwhelmed and tired. You’ll save money by making sure you use cold water and quick wash cycles. 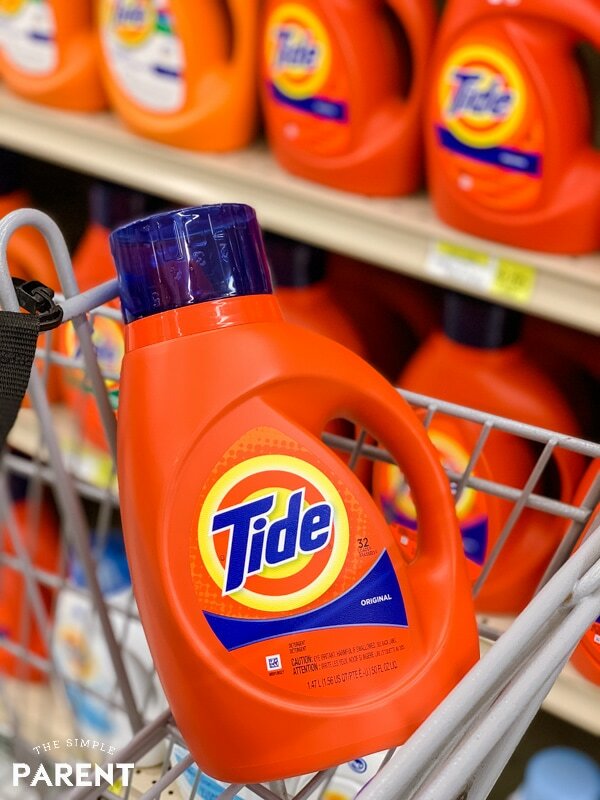 Be sure to stock up on your favorite Tide detergent and save so you can make this year where laundry takes up less of your time!